Becoming A UX Leader - The Branding Store | Logo Design, Web Design and E-commerce specialists.| Pembroke Pines, Florida. (This is a sponsored article.) In my previous article on Building UX Teams, I explored the rapidly growing need for UX teams as a result of the emergence of design as a wider business driver. As teams grow, so too does a need for leaders to nurture and guide them. In my final article in this series on user experience design, I’ll explore the different characteristics of an effective UX leader, and provide some practical advice about growing into a leadership role. I’ve worked in many organizations — both large and small, and in both the private and public sectors — and, from experience, leadership is a rare quality that is far from commonplace. Truly inspiring leaders are few and far between; if you’re fortunate to work with one, make every effort to learn from them. Managers that have risen up the ranks don’t automatically become great leaders, and perhaps one of the biggest lessons I’ve learned is that truly inspirational leaders — those that inspire passion and commitment — aren’t as commonplace as you’d think. Managing a team, ensuring all the team’s members are challenged and motivated. UX leadership is not unlike being bi-lingual — or, more accurately, multi-lingual — and it’s a skill that requires dexterity so that nothing gets lost in translation. This hybrid skill set can seem daunting, but — like anything — the attributes of leadership can be learned and developed. In my final article in this series of ten, I’ll explore what defines a leader and focus on the qualities and attributes needed to step up to this important role. Every leader is different, and every leader will be informed by the different experiences they have accumulated to date. There are, however, certain qualities and attributes that leaders tend to share in common. Great leaders demonstrate self-awareness. They tend to have the maturity to have looked themselves in the mirror and identified aspects of their character that they may need to develop if they are to grow as leaders. Skills you don’t know you don’t know, which you can identify through inviting your peers to review your strengths and weaknesses. 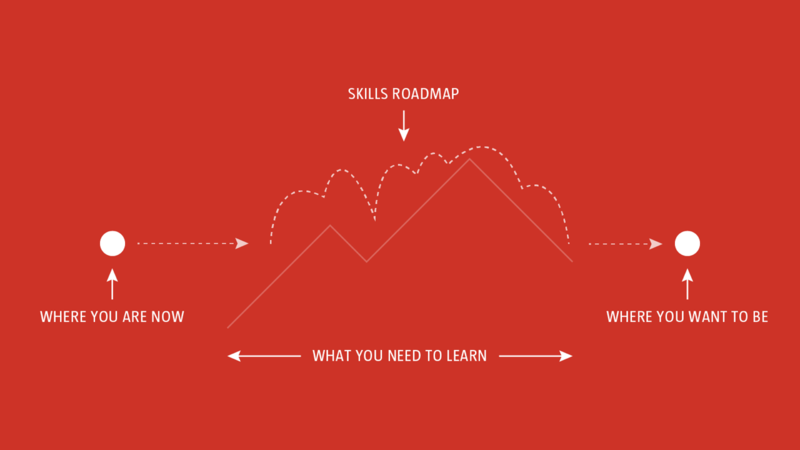 In short, a skills audit will equip you with a roadmap that you can use as a map to plot a path from where you are now to where you want to be. To become an effective leader is to embark upon a journey, identifying the gaps in your knowledge and — step by step — addressing these gaps so that you’re prepared for the leadership role ahead. One way to identify the gaps in your knowledge is to undertake an honest and self-reflective ‘skills audit’ while making an effort to both learn about yourself and learn about the environment you are working within. To become a UX leader, it’s critical to develop this self-awareness, identifying the knowledge you need to acquire by undertaking both self-assessments and peer assessments. With your gaps in knowledge identified, it’s possible to build a learning pathway to address these gaps. Planning and mapping time, often across a diversified team. These are just a handful of skills that an effective UX leader needs to develop. If you’re anything like me, hardly any of this was taught at art school, so you’ll need to learn these skills yourself. This article will help to point you in the right direction. I’ve also provided a list of required reading for reference to ensure you’re well covered. A 360º degree leadership assessment is a form of feedback for leaders. Drawn from the world of business, but equally applicable to the world of user experience, it is an excellent way to measure your effectiveness and influence as a leader. Unlike a top-down appraisal, where a leader or manager appraises an employee underneath them in the hierarchy, a 360º assessment involves inviting your colleagues — at your peer level — to appraise you, highlighting your strengths and weaknesses. This isn’t easy — and can lead to some uncomfortable home truths — but it can prove a critical tool in helping you to identify the qualities you need to work on. You might, for example, consider yourself an excellent listener only to discover that your colleagues feel like this is something you need to work on. This willingness to put yourself under the spotlight, identify your weaknesses, address these, and develop yourself is one of the defining characteristics of leaders. Great leaders are always learning and they aren’t afraid to admit that fact. A 360º assessment is a great way to uncover your ‘unknown unknowns’, i.e. the gaps in your knowledge that you aren’t aware of. With these discoveries in hand, it’s possible to build ‘a learning road-map’ that will allow you to develop the skills you need. With the gaps in your knowledge identified, it’s important to adopt some strategies to address these gaps. Great leaders understand that learning is a lifelong process and to transition into a leadership role will require — inevitably — the acquisition of new skills. To develop as a leader, it’s important to address your knowledge gaps in a considered and systematic manner. By working back from your skills audit, identify what you need to work on and build a learning programme accordingly. This will inevitably involve developing an understanding of different domains of knowledge, but that’s the leader’s path. The important thing is to take it step by step and, of course, to take that first step. We are fortunate now to be working in an age in which we have an abundance of learning materials at our fingertips. We no longer need to enroll in a course at a university to learn; we can put together our own bespoke learning programmes. In short, you have everything you need to enhance your career just a click away. Great leaders understand that it’s not about the effort of individuals, working alone. It’s about the effort of individuals — working collectively. Looking back through the history of innovation, we can see that most (if not all) of the greatest breakthroughs were driven by teams that were motivated by inspirational leaders. Thomas Edison didn’t invent the lightbulb alone; he had an ‘invention factory’ housed in a series of research laboratories. Similarly, when we consider the development of contemporary graphical user interfaces (GUIs), these emerged from the teamwork of Xerox PARC. The iPod was similarly conceived. Great leaders understand that it’s not about them as individuals, but it’s about the teams they put together, which they motivate and orchestrate. They have the humility to build and lead teams that deliver towards the greater good. This — above all — is one of the defining characteristics of a great leader: they prioritize and celebrate the team’s success over and above their own success. Truly great leaders understand the importance that teams play in delivering outcomes and goals. One of the most important roles a leader needs to undertake is to act as a lynchpin that sits at the heart of a team, identifying new and existing team members, nurturing them, and building them into a team that works effectively together. A forward-thinking leader won’t just focus on the present, but will proactively develop a vision and long-term goals for future success. To deliver upon this vision of future success will involve both identifying potential new team members, but — just as importantly — developing existing team members. This involves opening your eyes to the different aspects of the business environment you occupy, getting to know your team, and identifying team members’ strengths and weaknesses. As a UX leader, an important role you’ll play is helping others by mentoring and coaching them, ensuring they are equipped with the skills they need to grow. Again, this is where a truly selfless leader will put others first, in the knowledge that the stronger the team, the stronger the outcomes will be. As a UX leader, you’ll also act as a champion for design within the wider business context. You’ll act as a bridge — and occasionally, a buffer — between the interface of business requirements and design requirements. Your role will be to champion the power of design and sell its benefits, always singing your team’s praises and — occasionally — fighting on their behalf (often without their awareness). It’s possible to build a great UX team from the inside by developing existing team members, and an effective leader will use delegation as an effective development tool to enhance their team members’ capabilities. Delegation isn’t just passing off the tasks you don’t want to do, it’s about empowering the different individuals in a team. A true leader understands this and spends the time required to learn how to delegate effectively. Delegation is about education and expanding others’ skill sets, and it’s a powerful tool when used correctly. Effective delegation is a skill, one that you’ll need to acquire to step up into a UX leadership role. When delegating a task to a team member, it’s important to explain to them why you’re delegating the task. As a leader, your role is to provide clear guidance and this involves explaining why you’ve chosen a team member for a task and how they will be supported, developed and rewarded for taking the task on. providing feedback on completion of the task. When outlined like this, it becomes clear that effective delegation is more than simply passing on a task you’re unwilling to undertake. Instead, it’s a powerful tool that an effective UX leader uses to enable their team members to take ownership of opportunities, whilst growing their skills and experience. A great leader is selfless: they give credit for any successes to the team; and accept the responsibility for any failures alone. A true leader gives success to the team, ensuring that — when there’s a win — the team is celebrated for its success. A true leader takes pleasure in celebrating the team’s win. When it comes to failure, however, a true leader steps up and takes responsibility. A mark of a truly great leader is this selflessness. As a leader, you set the direction and nurture the team, so it stands to reason that, if things go wrong — which they often do — you’re willing to shoulder the responsibility. This understanding — that you need to give success and accept failure — is what separates great leaders from mediocre managers. Poor managers will seek to ‘deflect the blame,’ looking for anyone but themselves to apportion responsibility to. Inspiring leaders are aware that, at the end of the day, they are responsible for the decisions made and outcomes reached; when things go wrong they accept responsibility. If you’re to truly inspire others and lead them to achieve great things, it’s important to remember this distinction between managers and leaders. By giving success and accepting failure, you’ll breed intense loyalty in your team. A great leader understands that success is — always — a team effort and that a motivated team will deliver far more than the sum of its parts. As I’ve noted in my previous articles: If you’re ever the smartest person in a room, find another room. An effective leader has the confidence to surround themselves with other, smarter people. Leadership isn’t about individual status or being seen to be the most talented. It’s about teamwork and getting the most out of a well-oiled machine of individuals working effectively together. To lead effectively, it’s important to get out of your silo and to see the world as others do. This means getting to know all of the team, throughout the organization and at every level. Leaders that isolate themselves — in their often luxurious corner offices — are, in my experience, poor leaders (if, indeed, they can be called leaders at all!). By distancing themselves from the individuals that make up an organization they run the very real risk of losing touch. To lead, get out of your silo and acquaint yourself with the totality of your team and, if you’re considering a move into leadership, make it your primary task to explore all the facets of the business. To lead effectively, you need to have an understanding of others and their different skills. In my last article, Building a UX Team, I wrote about the idea of ‘T-shaped’ people — those that have a depth of skill in their field, along with the willingness and ability to collaborate across disciplines. Great leaders tend to be T-shaped, flourishing by seeing things from others’ perspectives. Every organization — no matter how large or small — is like an elaborate jigsaw that is made up of many different interlocking parts. An effective leader is informed by an understanding of this context, they will have made the effort to see all of the pieces of the jigsaw. As a UX leader, you’ll need to familiarize yourself with a wide range of different teams, including design, research, writing, engineering, and business. To lead effectively, it’s important to push outside of your comfort zone and learn about these different specialisms. Do so and you will ensure that you can communicate to these different stakeholders. At the risk of mixing metaphors, you will be the glue that holds the jigsaw together. Great leaders understand this: they set the bar high and they encourage and motivate the teams they lead to deliver on the details. To lead a team, it’s important to appreciate the need to strive for excellence. Great leaders aren’t happy to accept the status quo, especially if the status quo can be improved upon. Of course, these qualities can be learned, but many of us — thankfully — have them, innately. Few (if any) of us are happy with second best and, in a field driven by a desire to create delightful and memorable user experiences, we appreciate the importance of details and their place in the grand scheme of things. This is a great foundation on which to build leadership skills. To thrive as a leader, it’s important to share this focus on the details with others, ensuring they understand and appreciate the role that the details play in the whole. Act as a beacon of excellence: lead by example; never settle for second best; give success and accept failure… and your team will follow you. As user experience design matures as a discipline, and the number of different specializations multiplies, so too does the discipline’s need for leaders, to nurture and grow teams. As a relatively new field of expertise, the opportunities to develop as a UX leader are tremendous. Leadership is a skill and — like any skill — it can be learned. As I’ve noted throughout this series of articles, one of the best places to learn is to look to other disciplines for guidance, widening the frame of reference. When we consider leadership, this is certainly true. There is a great deal we can learn from the world of business, and websites like Harvard Business Review (HBR), McKinsey Quarterly, and Fast Company — amongst many, many others — offer us a wealth of insight. There’s never been a more exciting time to work in User Experience design. UX has the potential to impact on so many facets of life, and the world is crying out for leaders to step up and lead the charge. I’d encourage anyone eager to learn and to grow to undertake a skills audit, take the first step, and embark on the journey into leadership. Leadership is a privilege, rich with rewards, and is something I’d strongly encourage exploring. The Harvard Business Review website is an excellent starting point and its guide, HBR’s 10 Must Reads on Leadership, provides an excellent overview on developing leadership qualities. Peter Drucker’s writing on leadership is also well worth reading. Drucker has written many books, one I would strongly recommend is Managing Oneself. It’s a short (but very powerful) read, and I read it at least two or three times a year. If you’re serious about enhancing your leadership credentials, Michael D. Watkins’s The First 90 Days: Proven Strategies for Getting Up to Speed Faster and Smarter, provides a comprehensive insight into transitioning into leadership roles. Finally, HBR’s website — mentioned above — is definitely worth bookmarking. Its business-focused flavor offers designers a different perspective on leadership, which is well worth becoming acquainted with.